i am very well aware that most men don't wear suits anymore. it is a bit disheartening to see a lot of "homeless chic" looks being popular these days. growing up in the south i have always been taught to be a gentlemen, a southern gentlemen at that. 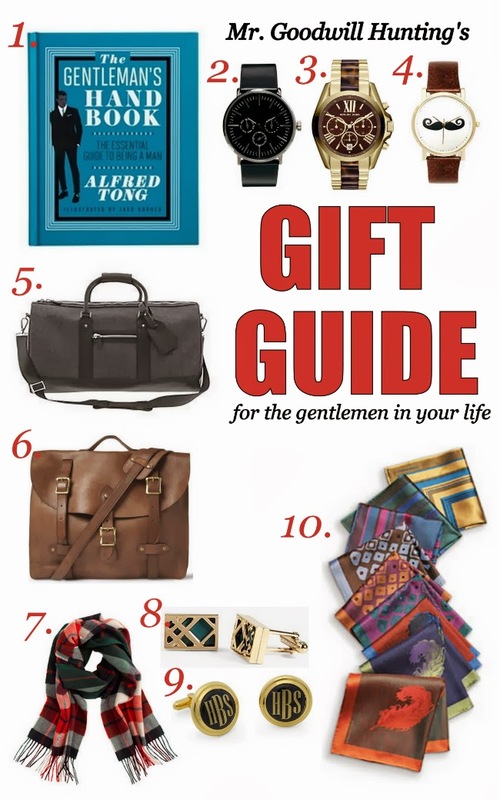 so here are some ideas for you or the gentlemen in your life. 1.this book will help you (or the your gentlemen) stay current on his chivalric duties. 2. this all black watch will keep him right on the edge of sophisticated fashion whether you/he is dressing up or down. 3. gold is making a comeback and this watch will certainly fit the bill. 4. this mustache watch is great for being casual and quirky at the same time. 5. this bag is excellent for the gym or a weekend getaway. 6. this double latched brown briefcase is perfect for the office or a business meeting. 7. scarves scarves (i have it) and more scarves. 8. cufflinks. every gentlemen should own a pair. 9. monogram cufflinks show a that extra care and thought was placed into gift giving. 10. pocket squares. pocket squares. pocket squares. the more the merrier. these are just a few things to get you started. you can always join me on pinterest to see more about picks for the special guy in your life.